What if All 50 States Get Ben Nelson's Medicaid Deal? 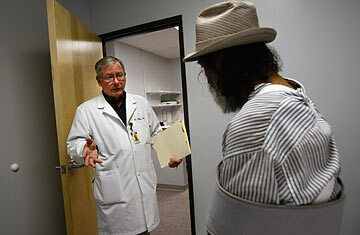 Thomas Hoffeld, chief of staff at the Spanish Peaks Health Center, speaks with a patient covered by Medicaid in Walsenburg, Colo. It's no wonder that the sweetheart deal Senator Ben Nelson got for his home state of Nebraska as part of the Senate health reform bill has caused such consternation among his colleagues. In exchange for his vote, say critics, Nelson was promised that the Federal Government would pay 100% of the cost of expanding the Medicaid program in Nebraska. The 49 other states, by contrast, would have full federal funding for a few years but would eventually have to pick up part of the tab. As soon as word of the special treatment broke, the deal became known as the "Cornhusker Kickback," and Nelson was roundly mocked. California Governor Arnold Schwarzenegger, whose state is in serious financial trouble that could be exacerbated by a Medicaid expansion, said in his recent State of the State address that Nebraska "got the corn and we got the husk." In the wake of the attacks, Nelson has done his best to deflect attention from the special arrangement. He insists the deal wasn't his idea, and, in a Jan. 15 letter to Senate majority leader Harry Reid, Nelson asked that special treatment for Nebraska be excluded from the final legislation. In the same letter, however, Nelson repeated something he has been saying since word of his special deal got around  that newly eligible Medicaid enrollees in all states should be fully and permanently paid for by the Federal Government. At first, this seemed like a crude and overly expensive solution, but as negotiations continue between House and Senate leaders over final legislative language, the idea of lessening the Medicaid burden for states is gaining traction. "Senator Nelson's deal has been a blessing to those states like New York that were feeling left out. It brought the issue back into public recognition," says James Tallon, a former New York state assemblyman and current president of the United Hospital Fund, a nonprofit philanthropic group that studies health care in New York. Helping states by extending the Nebraska deal nationwide or by upping federal contributions to future Medicaid costs would certainly relieve some unwelcome pressure. Along with Schwarzenegger, who had previously been a reliable Republican proponent of Democratic health care reform, many other governors  including New York's David Paterson, a Democrat  have publicly protested the legislation on the basis of the Medicaid expansion, saying it amounts to an unfunded mandate. In addition, at least 13 state attorneys general have said Nelson's special deal is unconstitutional. But extending the Cornhusker Kickback to all 50 states would be a lot more than a quick, short-term fix to a political problem. By further nationalizing Medicaid, a public insurance program that's now jointly funded by states and the Federal Government, Democratic reform could move the health insurance system even further under the umbrella of the Federal Government, which was the main criticism of the much maligned "public option." While the public option in its last iterations would have covered just several million people nationwide, Medicaid  under the expansion called for in health reform  could enroll some 35% of the population in certain states. Although the proposal to widely expand the Medicaid program has not garnered nearly as much attention as the public option or sweeping new insurance regulations, it's critical to the Democrats' reform strategy. The plan called for under the House and Senate bills would cover about 15 million new people  half of those currently without health insurance who would enter the system under reform. This plan terrifies most states but especially those like California and New York, where Medicaid benefits are already far more generous than most states in the South. That's because under the formula called for in reform bills, generous states would, paradoxically, get a smaller share of federal funding than states that currently have stingy Medicaid programs. The current Medicaid-expansion proposal would cost the Federal Government about $395 billion from 2010 to 2019 under the Senate bill or about $425 billion under the House bill. The state share of the expansion, in contrast, would be $26 billion or $34 billion. Moving the state costs into the federal column, as Nelson is now suggesting, would increase the cost of legislation, which is already close to the $900 billion limit set by President Obama. Then again, House and Senate leaders are currently negotiating all sorts of adjustments for a merged bill, and any new Medicaid costs could be part of that calculation. "Having the Federal Government pay the complete thing is not that big a deal," says John Holahan, an economist who has studied the Medicaid expansion extensively and who is also director of the Health Policy Research Center at the nonprofit, nonpartisan Urban Institute. Aside from the financial feasibility of extending the Nebraska deal to all states, there could be far-reaching policy implications of such a move. In contrast to Medicare, the other massive public insurance program, which is funded and run by the Department of Health and Human Services (HHS), administration of Medicaid has historically fallen to states. This has given governors and legislatures the flexibility to structure their Medicaid programs based on their populations and budgets. States now determine who qualifies for Medicaid, what's covered by the program and how much doctors and hospitals get paid for taking care of Medicaid patients. The Federal Government currently pays about 57% of all Medicaid costs, with the rest shouldered by states. But under reform, the Federal Government would eventually pay 82% to 95% of Medicaid costs for the 15 million people who would become newly eligible. At that point, the result would be a huge public insurance program funded mostly by the Federal Government. By contrast, the public option  which exists in the current House bill but seems headed for a quiet death because of moderate Democrats' concerns that it would lead to socialized medicine  would have included no federal funding of benefits. Some health-policy observers wonder if an expanded federal role would prompt HHS to take a heavier hand in running what has been a state-controlled program. Says Gail Wilensky, a health care economist who held high-level governmental positions under both Bush presidencies: "Up until now, I have described Medicaid as a state program with federal oversight. That will obviously change."